Förg’s Speedway Transport System concept uses a network of linear electric motors to propel cars along the highway. He sees us driving around in futuristic dual-mode electric cars with small motors for city driving. When we’re ready to leave town, a contact-free linear motor would propel the car over long distances with a drifting magnetic field. Förg says linear motors would work under our existing roadways, complementing – not replacing – existing automotive technology. If this ever gets taken up it’ll be interesting to see what alternative uses the street finds for this technology. A slight non-sequitur: Will Hutton writes in the Guardian on the dire state of the UK rail network, and how in order to remain economically competitive, Britain must invest in the kind of high-speed rail they have in Europe. Lotus and Brazilian car manufacturer Obvio have a number of versions of cute VW Beetle-esque cars that run on any combination of ethanol, petrol or natural gas. They also have optional upgrades to become plug-in electric vehicles. They have a very consistent design style and the car even features an inbuilt ‘carputer’ with GPS, details on nearby locations such as restaurants and virtual instrumentation. You can also use the console as a normal PC. The engine uses continuously variable transmission (CVT) rather than distinct gears which aims to cut down on fuel use. The Obvio 828 is projected for sale at around $14,000 and the more sporty Obvio 012 is projected at $28,000 although the electric versions are currently a lot more. Glen Hiemstra of Futurist.com has a video on his home page called ‘Outlook 2008′ in which he discusses his five big stories for the coming year, plus a wild card. He talks about oil prices, the economy and the political changes (or non changes with the presidential elections so close to the end of the year) of 2008. Two more technological comments caught my eye. He mentioned both Solar and Nano technologies as big movers in the coming year. In particular he highlighted NanoSolar, whose thin-film solar cells have just started reaching commercial grade at potentially cheaper prices than coal. 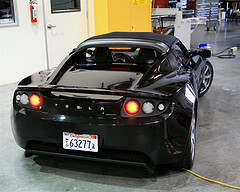 The other company on his watch list was Altairnano, which uses ceramic nanomaterials to create long-living batteries that should see the market in a number of forms in 2008, including in electric cars such as the pictured Tesla Roadster. It will be interesting to see if these predictions come true. Other turn of the year predictions include a pessimistic James Kunstler and an optimistic 50-year prediction by Climate Progress. Lithium-ion batteries, such as those used in your laptop, mobile phone or hybrid car, are extremely important in today’s world but are limited by the amount of lithium ions that the typically carbon anode can hold. Stanford announced this week they’ve developed a new method that can increase the amount of charge held by as much as 10 times. I’ll look forward to my laptop with 25 hour battery life in a few years, then.